The Yamaha Arius YDP-163 is an 88 key digital piano. There are several features worth noting, but some of the most valuable points to consider when looking at this digital piano is whether this piano is worth its high price tag, what kinds of players it is geared towards, and whether its outshines its competitors. In this article, I’ll be breaking down everything the Yamaha YDP-163 has to offer, and we’ll also directly compare it to some of its popular peers (namely, the Yamaha YDP-162, the YDP-181, the YDP-S52, and the CLP-525). 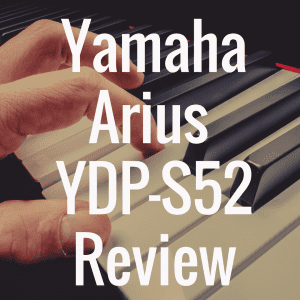 Before we get started, please take a quick moment to see how well the Yamaha Arius YDP-163 compares to other pianos within the Arius lineup, like the YDP-143, the YDP-181, and the YDP-S52. The first thing worth mentioning about the Yamaha YDP-163 is that it is a digital piano, not a keyboard. There is a difference, believe it or not. The difference is that a digital piano works hard to closely replicate the touch and tone of a real piano, while a keyboard is built to emulate the sounds, but can vary dramatically on touch and weight, size, sound bank options, and more. This, of course, is nothing new if you’ve been playing piano for years, but for anyone that’s venturing into the world of piano for the first time but is interested in making a high quality (and potentially expensive) first choice, I figured it was worth noting the distinctions. Now, as far as visual aesthetics go, this piano certainly stands out. It looks like a real upright piano, even though it is digital. At just over 90 lbs., this piano is no doubt very sturdy and can easy fit into your home and be an attractive part of the furniture. The YDP-163 comes in black or satin white, and the finish on the wood grain looks convincingly authentic. On real upright pianos, the harp (the place where the hammers strike the strings) is located in the cabinet behind the keys. In fact, it’s called an upright piano because the harp literally stands up, instead of flat on its back like a grand piano. The YDP-163 emulates this look by using a big upright cabinet behind the keys that is attached to two long, slender feet that behave as the stand for the keyboard. However, the difference here is that the cabinet opens up in a space about halfway down, creating a big gap in the stand. Two planks of wood hold the stand together, and if the digital piano is not against a wall, you can see through the gap while facing the back of the piano. The black sliding key cover hides and reveals the ivory-colored keys and protects them from dust when not in use. The console comes with a built in music stand that has the same black wood grain as the top of the cabinet behind it. It’s sturdy and relatively wide, good for placing arrangements, compositions and sheet music at just below eye level for ease of reading while performing. The bench that comes with the digital piano is sturdy, all black (or satin white if you go with that version) with a leather cushion on top. There are three durable pedals attached to the bottom of the stand, much like you would find on a standard upright or grand piano. For those of you who are unsure what these pedals do, I’ll explain briefly. The pedal to the far right is the sustain pedal. The sustain pedal traditionally removes all dampers off the harp in the back of the piano so that the strings continue to ring out after a key is struck. That’s why when you hold the pedal down and press a key, the sound continues for a while even after you let go of the key. Release the pedal, and the sound while stop as soon as you lift a finger up from the key. Since there’s no harp in the YDP-163, this sustain effect is simulated digitally. The pedal on the far left is the una corda pedal. It moves the hammers so that each hammer only strikes one string. See, normally each hammer hits a group of strings. This causes the piano to have a loud, brighter sound. But when only one string is hit per key, the sound gets a little more mellow and darker. It’s another effect that is digitally simulated on the YDP-163. Now the third pedal, the middle one, is a little bit more confusing. It allows you to sustain only certain notes based on when you play them. You’ll have to play around with it yourself to see what I mean, but usually players only play with the far right and far left pedals. However, the middle pedal can add some nice effects, too. The keys are weighted to simulate the feel of a real piano. The YDP-163 does very well in this aspect. 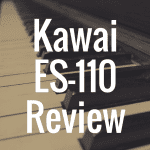 The keys feel great, and can add a sense of realism other keyboards might miss out on. Yamaha refers to their key technology as a Graded Hammer 3 style, which means that there are three sensors attached to each key that can pick up volume and velocity with ease. The GH3 sensor technology emulates a grand piano action, not an upright piano’s action. Playing this digital piano loudly or softly is possible because of this kind of technology. There are 88 keys on this Arius digital piano, allowing every type of player to have access to the full range. Jazz, classical, and pop music players alike can all have a blast hitting every single note on the wide keyboard. The YDP-163 has a 192-note polyphony, meaning that you can pretty much play any song imaginable without any notes getting lost in the mix. For really technical players that are looking for a nice digital piano, this is a must-have feature. This piano comes with a practice metronome and a recorder that can record one song at a time with up to two tracks. This is nothing fancy, but can come in handy for those who want to listen to composition ideas or practice techniques by hearing what they just played. As usual, there is a master volume knob and a power button. This digital piano consumes 12W of power and needs to be plugged into a power outlet. The YDP-163 cannot be battery powered, but it does power off by itself, if you leave it alone for an extended period of time. The YDP-163, while it looks more like an upright, is actually designed to simulate the sounds of a grand piano. The sounds are sampled from a Yamaha CF3S concert grand (a nine-foot long grand piano) to emulate huge, rich, warm tones. Because the tones are extremely thick, the sustain pedal needs to be used with finesse. Holding the pedal down for too many notes will cause everything to blur together really quickly. If that’s the sound you want, then go for it, otherwise you’ll need to be extra precise with how you use your pedal. As a new feature, the YDP-163 (and the YDP-143, for that matter) can connect to Yamaha’s digital piano controller app that allows you to play with different sounds. The app doesn’t have a lot of options like a synthesizer, but it does add to the range of the instrument’s capabilities, which is nice. The app does offer some parameters like pitch, effects, and tuning. You have to connect with Bluetooth or a cable to use the app. There are ten preset voices included in the Yamaha YDP-163’s library that include standard electric piano sounds, organs, strings, and more. However, the investment required for this digital piano is for its primary piano sound, not its additional sounds. The additional sounds are not ideal for performance or recording due to limitations with sound tweaking. Just like a lot of Yamaha keyboards and digital pianos, you can layer dual voices to combine sounds like strings and piano to create a bigger sound. The stereo amplifier in this digital piano is very nice, however. It comes with two 20W speakers, which should allow for the perfect volume in the home. Since this digital piano is big, it probably should not be used for performance anyway, so the speaker system will likely suffice. The YDP-163 also has a headphone jack and a USB to host input, if you want to listen in headphones or use the piano as a MIDI controller, respectively. The YDP-163 is superior to the YDP-162 (the 163’s predecessor) in a few ways. First, the 162 only has a 128 note polyphony. Secondly, the YDP-162 does not have the GH3 action (it only has GH or Graded Hammer action, which is better than GHS action but not quite as good as GH3). It does have graded hammer sensitivity, however. 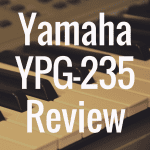 You can read our in-depth comparison review of the Yamaha YDP-162 vs Yamaha YDP-V240 here! The Yamaha YDP-181 has an LED display and more buttons on its front face than the 163. It has 14 voice presets, but the sampling is not from the Pure CF Sound Engine, and it uses a stereo sampling engine instead. It still sounds great, but it is slightly less powerful than the 163. The YDP-S52 is probably the best competitor for the YDP-163, with the exception that it looks less like an upright and more like a keyboard sitting inside a console stand. It also costs a few hundred dollars more and consumes 2W more in power. However, it is lighter than the 163 and the key cover folds all the way over the face of the keyboard itself (instead of only having a sliding cover), making it a little more compact when it’s closed. Now, if you’re looking for something with even more polyphony (256 notes) that looks like the YDP-163 and costs about the same, try the CLP-525. 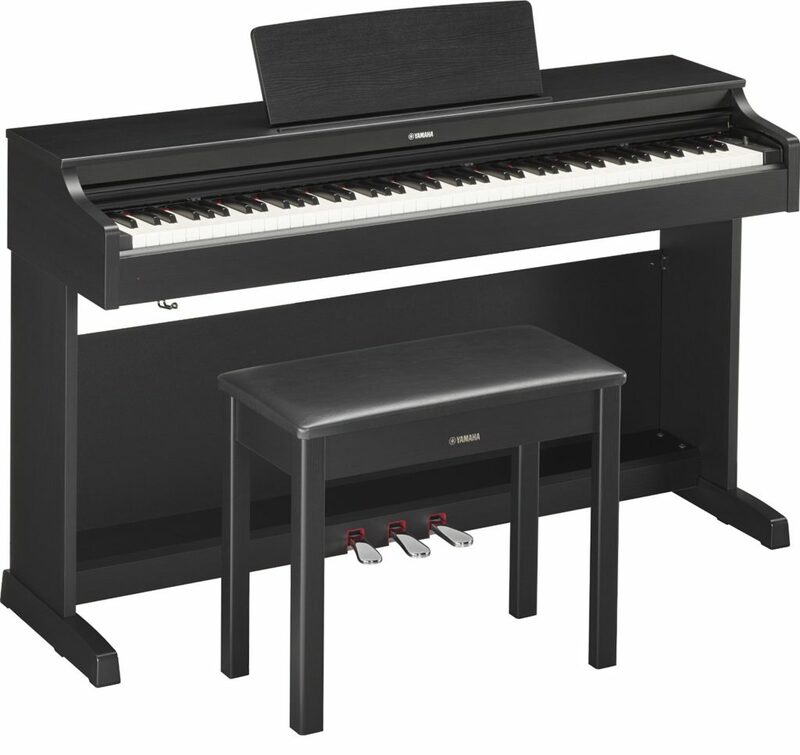 This Yamaha Clavinova series digital piano is very comparable to the YDP-163, although it has a CFIII engine instead of a Pure CF Sound Engine. You can read our review of the Yamaha CLP 525 right here. Is the YDP-163 Worth the Money? The Yamaha YDP-163 costs around two thousand dollars, and because of its price, it should really be purchased by people that are serious about playing piano and want a really exceptional sound. 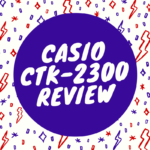 Amateurs and beginners looking to play casually should probably go with something cheaper (like the Casio PX-860, for example). There are also a lot of limitations with this digital piano. There aren’t many sounds, and you certainly will be hard pressed to move this sucker. But the grand piano sound that emits from this piano, coupled with the feel of the keys, is quite an extraordinary feat. 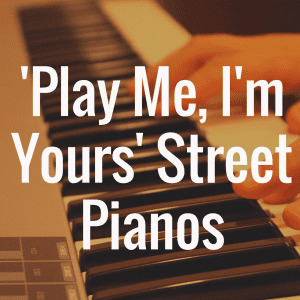 If you have the money, and you possess the dedication and commitment to play the piano, then this is certainly an instrument that’s worthy of your consideration. 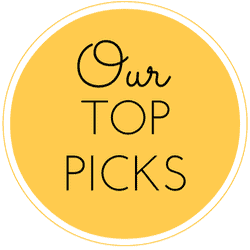 If you found this article helpful, please “like” us on Facebook! 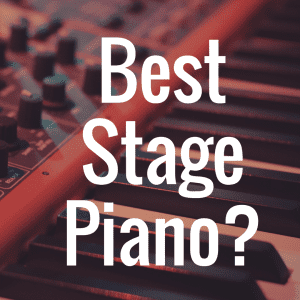 What’s the Best Yamaha Arius Digital Piano?